When you envision a healthy food blogger’s kitchen, you likely picture a curated refrigerator with shelves of vibrant produce and cabinets full of spices fit for any (totally Instagrammable) meal on the docket. But wellness-centric food bloggers Maria and Alyssa Tosoni, sisters/BFFs/and co-creators of Spinach for Breakfast, reassure us that though they do eat every veggie skillet and avocado-chocolate pudding they photograph, they’re not always prepared to make dinner from scratch. 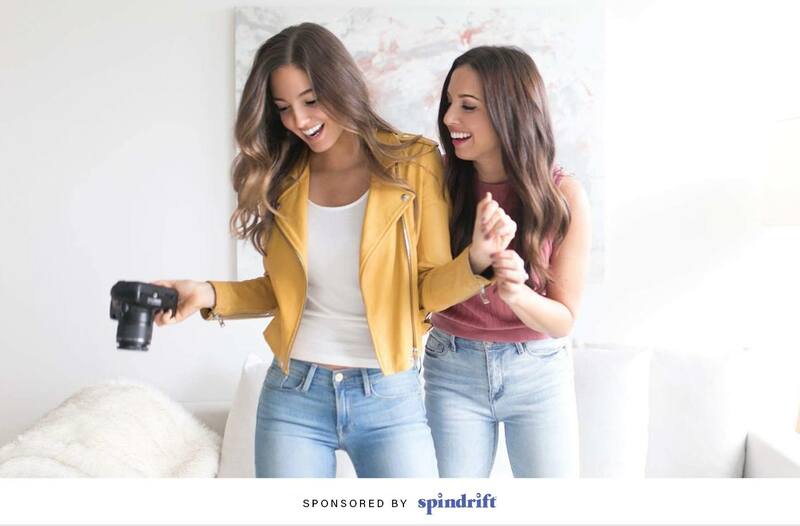 In the spirit of keeping it real, we teamed up with Spindrift—the fizzy bev made with just sparkling water and real squeezed fruit—to get the low down on the meals Maria and Alyssa make off camera. The staples Maria keeps on hand so she can whip up quick, quality meals include nut milks, plant-based protein, organic eggs, and greens—which she uses in veggie scrambles and green smoothies. In the freezer, she stocks veggie burgers, cauliflower pizza crust, frozen veggies, and organic chicken. One of Maria’s simple go-to meals is eggs on a rice cake with hummus, kale, and avocado. And when her cupboard gets super bare (been there), Alyssa isn’t above ordering takeout. How’s that for some real talk? Scroll down for the 5-ingredient summer salad you can whip up on your busiest days—plus, *the* drink to pair with dinner. Keep this easy twist on traditional caprese salad—plus refreshing chunks of cucumber—in your back pocket for whenever you’re in the mood for an easy no-cook meal (uh, all summer long). Turn up the crispness of your meal by pairing it with a can of Spindrift Cucumber Sparkling Water, pure sparkling water made with freshly pressed cucumbers—and that’s it. Pop open a can for a cool and refreshing way to wash down dinner. It’s a match made in (real) food heaven. 1. Toss cucumber, tomatoes, onion, basil, and mozzarella into a large bowl. 2. In a small bowl, whisk olive oil, garlic, oregano, parsley, red pepper flakes, sea salt, and pepper until combined. 3. Pour over the salad and gently mix through. 4. Allow to rest for about 10 minutes to let the flavors absorb before serving.